Are you living the steno life? ← For the Record – Court Reporting Documentary Trailer! Electronic Recording is Here!!! Run!!! If you’re a court reporter (or court reporting student) who works on an actual steno machine – RUN!!! The day you’ve been dreading is finally here!!! Electronic recording is taking over! Doubt me? Take a look at the article below. Looks a bit like Daft Punk without the costume. Wicka-wicka-wah! Okay, so maybe the reports of electronic recording taking over the world are a bit premature…like 78 years premature. That article above was written in 1936. 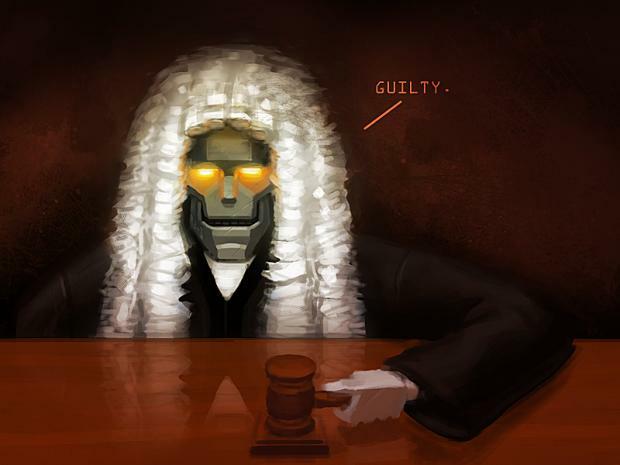 And besides the actual technology, the claims haven’t changed much – 100% accuracy – adaptable to any courtroom – captures any speed spoken. Of course the operator still has to remember to turn it on…so there’s that 🙂 No biggie – it’s just a murder trial. And that’s all fine and good until the robot revolt happens and they turn us all into slaves. To some extent, the claims are true. Electronic recording can capture pretty much any speed (as long as the hardware keeps up). And it can capture everything that’s said (as long as it’s not muffled, too quiet, several voices at once). And it does replace the court reporter (with a different person who cannot provide a realtime record). And it’s less expensive (unless there’s a problem, like someone doesn’t turn it on, causing a retrial). The biggest step in electronic recording over the last 80 years has been that it is no longer the size of an ordinary desk. They’ve whittled it down to a computer and some microphones. Kudos to them! Share this post with others! Select your social source icon below. 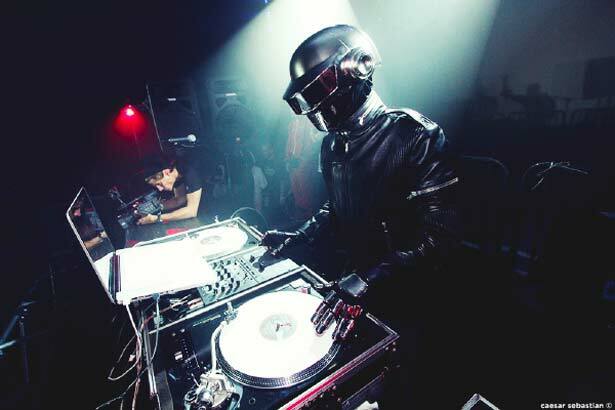 This entry was posted in General Steno Info and tagged court reporter, court reporting, daft punk, electronic reporting. Bookmark the permalink. 1 Response to Electronic Recording is Here!!! Run!!! With a great deal of respect to the author, ’cause I suspect we’ve exchanged an e-mail or two and I’m a closet fan of all Simply Steno’s work, I feel some basic concerns should be set out, and I hope that this comment’ll be approved so that people might be edified and motivated to put their best foot forward for the profession. I’m a deposition reporter in New York City, and I’ve done a fair amount of research on this stuff in the context of New York State EBTs. I’ll only touch on the fact that I’ve heard recorders are replacing retiring reporters in a few courtrooms, like Family Court. Our importance is limited to policymakers’ perceptions. In the EBT world, our policymakers are our customers. With regard to our EBTs (depositions), it’s legal to record testimony, and this has given rise to one record-audio-make-transcript company I know of, ****************. According to their website, they use multi-track recording in order to help with the transcription of overlapping voices. 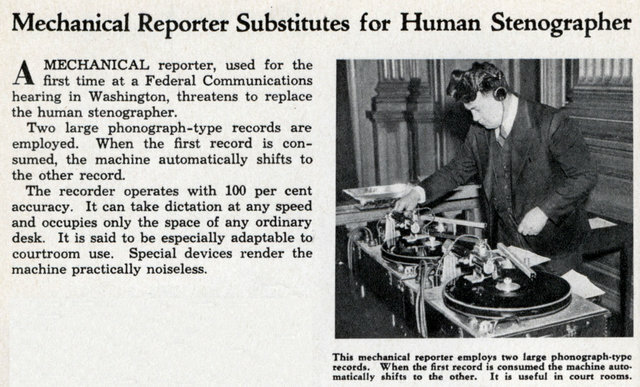 Luckily, the stenographic reporter to electronic recorder or voice writer ratio’s still great, and there’s still a lot of potential for stenographic reporting and voice writing. The main issue I’d like to leave here is that our importance only goes as far as perception. If attorneys or insurers perceive that electronic recording is better, they can switch to that tomorrow, legally, no history required, and without care for any deposition reporter in New York. A few court reporting agencies have transcription jobs already, and if it became popular tomorrow, they’d change to ER, and I’d wager you’d have less CRs working for less pay. Now for some great news. It won’t happen soon. Court reporters of every age and level of professional experience can keep court reporting popular forever. It starts with a person’s professional performance. Reading back off audio and submitting transcripts that have stenographic outlines left in them ensure that customers’ perceptions of stenographic reporters go low. You, as an individual, keep them high every time you write well, read back, and submit a complete transcript. Everyone makes mistakes, but limiting our own mistakes and marketing ourselves as the go-to crowd for deps is the only way to keep the stenographic community healthy and vibrant for another 80 years. Articles like this one benefit us all a great deal by bolstering confidence and giving students a compelling reason to join a growing community, but I hope we can all also face the reality that there are challenges looming ahead, and that we overcome them by addressing them and keeping our skills sharp. Balance pleasing policymakers with ethical incorruptibility, and then there’ll be nothing to replace a reporter no matter how good tech gets. The take away for anybody reading: Care about your work, because every professional that cares keeps us a step ahead of a robot judge-reporter. Court Reporter or Cat Wrangler? Court Reporting School – Am I Too Old?? Pam on Court Reporting School – Am I Too Old?? William Dunn on Get On The Court Reporting School Roller Coaster! Joy Will on Court Reporting Documentary – Behind the Scenes!